Orange County, FL– Mayor Teresa Jacobs joined Orange County’s employees and citizens in celebrating our Puerto Rican community and all of their wonderful contributions at the Puerto Rican Parade and Festival on Sunday. 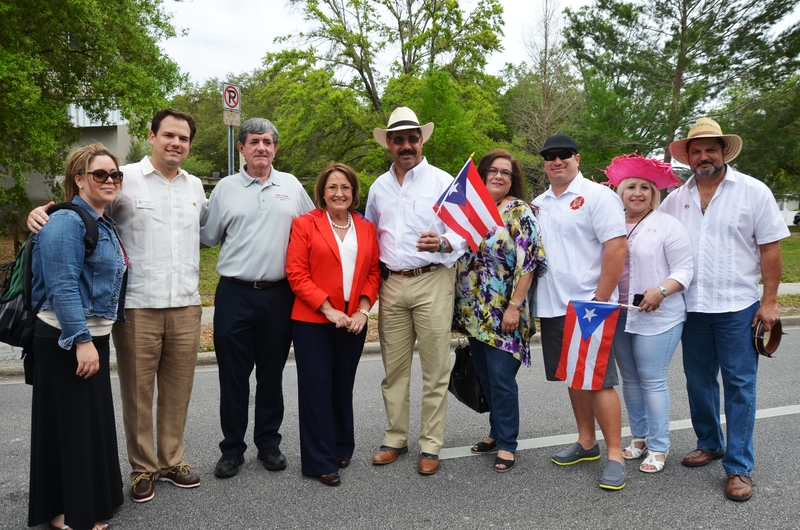 Mayor Jacobs was also joined by District 1 Commissioner S. Scott Boyd, District 3 Commissioner Pete Clarke, Orange County Clerk of Courts Eddie Fernández and City of Orlando Commissioner Tony Ortiz for the parade procession which began at Ferncreek Avenue and ended at Orlando Festival Park. Attendees enjoyed a variety of culinary delights, festive music and live entertainment in celebration of the Puerto Rican community. The parade’s grand marshal was Joaquín Claudio who is noted in the Hispanic community for his artistic and cultural achievements. The parade honored Mildred Zapata, who founded and produced the Desfile Puertorriqueño de Florida, known as the Puerto Rican Parade of Florida. An estimated 150,000 Puerto Ricans call Orange County home. Puerto Ricans in our community have distinguished themselves in countless endeavors and continue to play an instrumental role in maintaining Orange County as the best place in the world to live, learn, work and raise a family. Their hard work and dedication continues to strengthen our community’s diverse fabric of peoples and cultures. Many Hispanic Americans hold positions of prominence in Central Florida. From the business, military, educational, political and philanthropic spheres, Latinos continue to excel and contribute to the vitality of Orange County and our nation. For this reason, Orange County continues to support and collaborate with Hispanic entrepreneurs through the Hispanic Business Initiative Fund (HBIF). In 2013 HBIF, Florida’s leading Hispanic economic development organization, received $123,472 from the Board of County Commissioners. In April, the Orange County Convention Center will again host the Hispanic Business and Consumer Expo, an annual event organized by the Hispanic Chamber of Commerce of Metro Orlando that features more than 300 booths and over 12,000 attendees, and recognized as one of the largest Hispanic trade shows in the U.S.
As one of the signature convention center events of the year, many Orange County employees will be greeting attendees at our large pavilion at the Hispanic Expo to share information about Orange County’s services, civic engagement, and volunteer opportunities. A variety of photos from the Puerto Rican Parade and Festival are available for use by the media and are located on Flickr.